It’s been quite a while since we’ve sent a newsletter update so I wanted to fill you in on the latest happenings. We’ve been super busy since the beginning of the year making updates and improvements. Here’s what we’ve been up to! We’ve revamped our dashboard in an effort to make it easier to find your active licenses along with the terms and docs. The default view should now show you your most recent active licenses and any license that has been upgraded or renewed should be hidden. If you see a license that is not hidden and that is no longer in use let us know and we can hide it. You can still view your complete order history and details under Purchase History & Invoices. 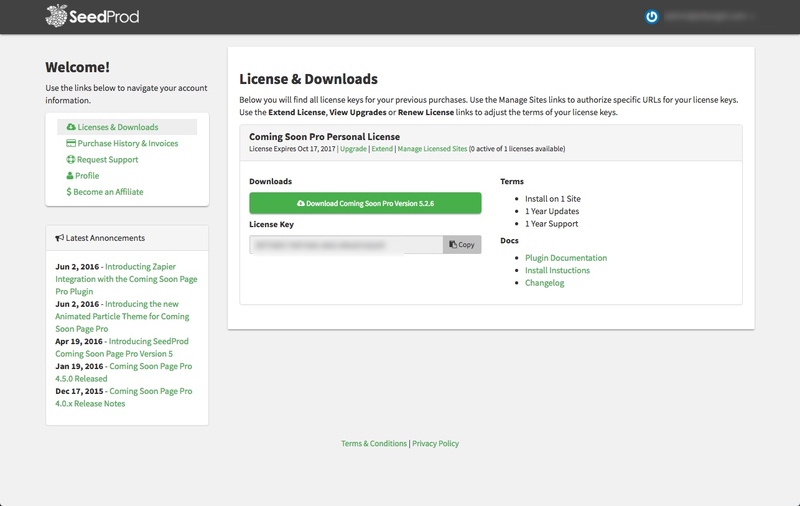 We’ve also made it easier to see and manage which sites are licensed under the Manage Licensed Site section. When you deactivate a license it will now remotely deactivate a license on that website so you don’t have to manually deactivate on the site. 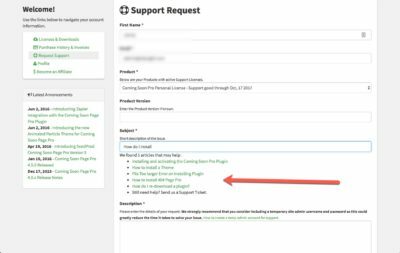 Also now when you start a support ticket and type your subject we will auto suggest help topics to help you resolve your issue quicker. Finally we’ve update all our servers so everything should be zippy! Coming Soon Pro Version 5 is our biggest release yet and has been out since May. Version 5 is super stable and is our preferred version now. 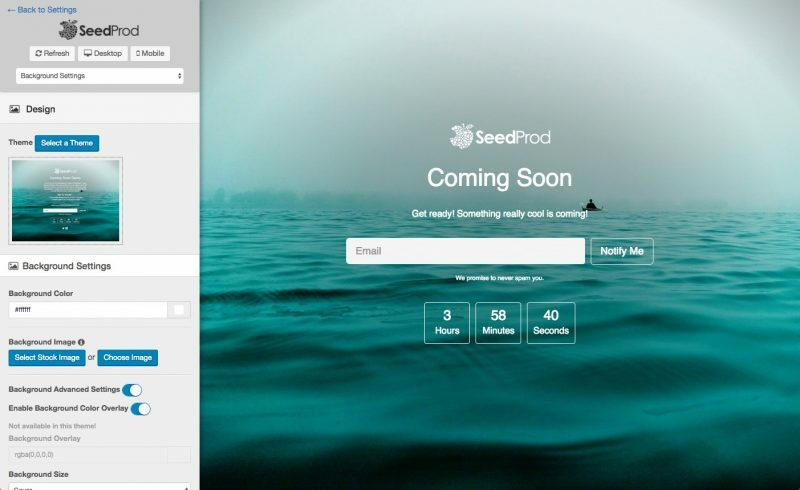 Learn more about SeedProd’s Coming Soon Pro Version 5’s features. In addition we have also released two new Add Ons that let you create multiple coming soon/landing pages on one site and an Add On that lets you create you coming soon page in multiple languages. You can upgrade your current license in the members area to our new Developer License with Add On Package if you need this functionality. This will be the last time a manual migration will be required. We made the mistake of switching to a 3rd party settings framework in version 4 which cause many unforeseen issues. We rebuilt version 5 from the ground up to be our fastest most reliable version to date. This is only relative if you use MailChimp in out plugins. MailChimp is retiring Versions 1 and 2 of their api and requiring all developers to be using the latest version, Version 3, of their api by the start of the New Year. Version 3 support has been added to all our plugins and in the Coming Soon Page Pro Plugin since version 5.2.0. Any new installs automatically use version 3 of the MailChimp API and if you were using version 2 there will be a link in the MailChimp configuration to switch to Version 3. Make sure to test after you switch since some functionally has changed from version 2 to 3 of the MailChimp API. Here’s the email from MailChimp for more information. 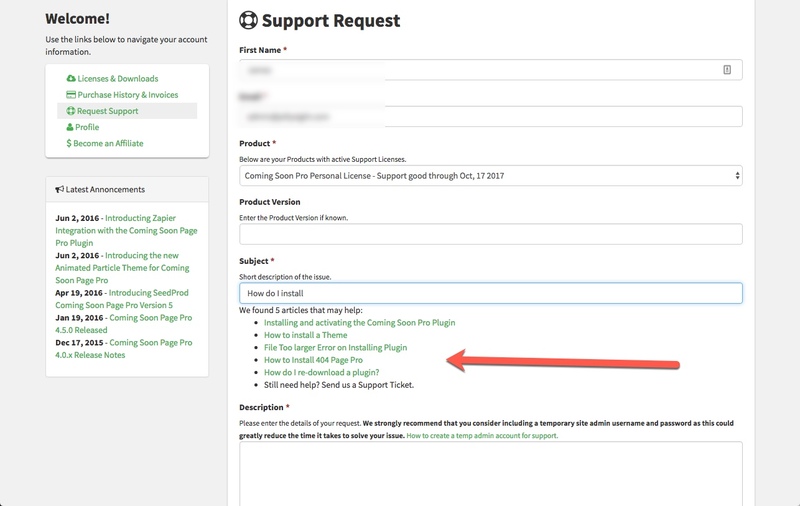 We have released a new notification bar plugin that makes it support easy to display notices, collect emails and created time based calls to action on your website. Learn more about our WordPress Notification Bar Plugin. We have also released a plugin that makes it super easy to customize the default WordPress login page. Add a logo, change colors, fonts, text and more. It uses our realtime customizer we originally built for our Coming Soon Plugin and makes changes to your WordPress Login page fast and easy. Learn More about our WordPress Login Page Customizer Plugin. We have updated our custom 404 page plugin to use our new realtime customize as well. You can download Version 2 from the members area. Currently the is not a way to migrate settings from version 1 to 2 but there will be by the end of the year. One of the most requested features is the ability to collect more data than just name and email. I’m working to get a new Form Builder Add On that I hope to have out by the end of the year that will let you do just that. More themes for the Coming Soon Page Pro Plugin. I will be releasing a new theme each week next year for the Coming Soon Plugin to build up our theme library and to help you get started quickly. We released http://comingsoonpage.com this year which let’s you create html coming soon pages you can use on any site and not just WordPress sites. We will be adding this into our new upcoming SeedProd Site Membership that will give you access to all our plugins and services for a low yearly price. More about this to come. We also have a few more plugins planned for 2017. Got a idea or feature request, let us know!